On the Hunt in Daytona Beach: Shells, Seaweed, Sea Glass & More! Beachcombers flock to Daytona Beach to search its shores for shells as unique as the destination. Hunting for seashells is a time-honored tradition of vacationers in the Daytona Beach area, and the activity is just as fun today as it was when your grandparents did it! This old-fashioned beach hobby doesn’t require any fancy gadgets — all you need are your eyes and a bucket. Take a break from technology and pare things back down to a time when life was a little bit simpler. Looking for seashells is a favorite vacation tradition that is simple and soothing. Whether you are a toddler, a teen or a retiree, discovering a one-of-a-kind shell prompts the purest of joys in everyone. And isn’t that what a beach vacation is all about? The main attraction and most common treasures you’ll find while perusing the beach are seashells! They range in size, color, shape and function, and you are allowed to take a few as a souvenir — just make sure that none are serving as a home for a living creature, because those are off limits. You might find clam shells, oyster shells, kitten’s paw, conchs, scallops, cockleshells, sand dollars, whelks, olive shells and so many more! Sea lettuce, algae and sea grass are often lumped into one group of “seaweed” by beachcombers, but they can be interesting to sort through. They come in various shades of green, brown, pink and even purple. Lots of tiny critters and creatures live inside in the wrack — or, that line of seaweed and debris left along the shoreline where the water meets the edge of the beach — and are eaten by birds and crabs. You might even stumble upon pieces of glass that have been rubbed and abraded over years and years so that they are smooth as silk. Craft lovers are especially thrilled to find these colorful pieces of sea glass, as it makes interesting and unique jewelry. These items are aptly named — if you find them, you won’t wonder for long why they are called what they are! Sea sponges typically have an orange/yellow-ish hue and are actually comprised of tiny marine animals’ skeletons (which explains their smell!). Squirts, a type of tunicate, are kind of squishy, shoot a thin stream of liquid if squeezed and may come as quite a surprise if you accidentally step on one! These are a beachcomber’s gold! Shark teeth are often hard to spot among the darker sand and piles of crushed shells, which makes finding one that much sweeter. Not only is a shark tooth a cool bragging right for eagle eyes, they are downright fossils! That’s right — those black teeth you occasionally find along the shore are estimated to be somewhere between 10,000 and several million years old! The sediments they stay in for so long change their white color — and they make one cool treasure to take back home. With a total of 23 miles of beaches to explore in Daytona Beach, you’ll have no trouble finding a spot to look for seashells. You could start your beachcombing in Ormond-by-the-Sea one day, stroll along Ormond Beach and Daytona Beach the next day, and eventually make your way down to Ponce Inlet. There are many handicap-accessible entrances, and plenty of on-beach and off-beach parking, depending on what part of the beach you are visiting. 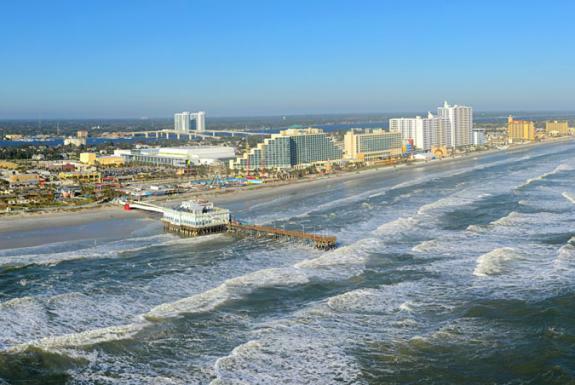 View all of the beach accesses in Daytona Beach, and brush up on the beach rules while you’re at it. Remember: Don’t leave anything on the beach but footprints! Have you planned your summer getaway to the beach yet? Daytona Beach is incredibly accessible by car and plane — so you could be combing the beach for treasures this time next week! Start planning your trip today.